Alocasia maharani - Another Jewel for You to Consider! This newer plant might seem similar to others I've covered previously, but this is definitely a distinctly different Jewel! Read on to learn why . 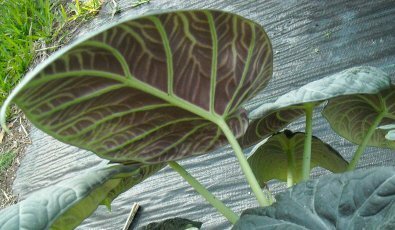 . .
A quick look at this plant and one might conclude that it is a variation on Alocasia rugosa, a plant which I covered in this article. However, a closer inspection reveals that A. maharani is unique and merits a separate place amongst the other Jewel Alocasias. I do have my own opinion about the true origin of this plant, but will reserve that for later in this discussion. A. maharani is the name under which this plant is being sold, but I cannot vouch for the scientific accuracy of that name. 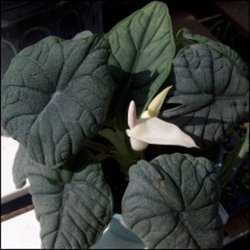 Some list this plant with an alternate specific spelling, as Alocasia maharanri, but in any event, I have not seen published information about either the origin of this plant or the valid scientific nomenclature applicable to it. A. maharani may have an origin involving either the country of India, or a person from India being involved in the introduction of the plant. I base this on the specific name being used for it. 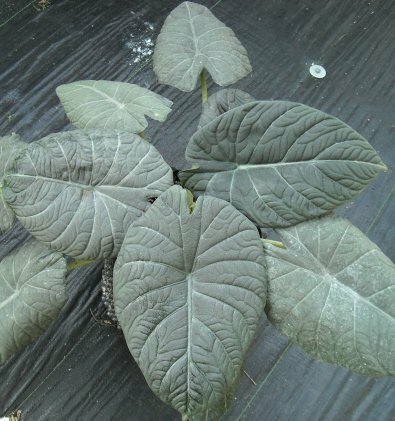 If so, I'd like to call this plant the "Indian Princess" so as to provide the royal description that befits both the name and a Jewel Alocasia. As far as culture goes, this plant is a little easier to grow than some of the other Jewels, but I still recommend very well-draining soil medium, bright light but not direct sun, and either a timed-release fertilizer or weak regular liquid feeds. The thick leaves are reminiscent of those found on A. rugosa. Thick leaves give a signal that the plant is equipped for occasional drier spells, or grows in an environment that dries out quickly, such as on rock ledges or slopes with loose debris. Oh, and I'm also confident that this plant prefers temperatures in the mid 80s F in the daytime and the upper 60s to mid 70s F nighttime. 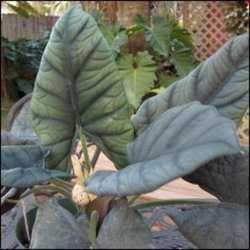 With my experience both in growing Alocasia plants as well as in hybridizing them, a study of this plant has provided me strong evidence that it is not a pure species. I suspect that this plant is either a natural hybrid or one artificially produced. To me, A. maharani looks very much like what I would expect as progeny from crossing A. rugosa with A. reginula. The leaves are thicker than those on the Little Queen, but not so thick as those on the Rugose Jewel. 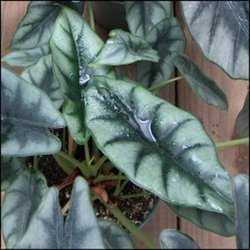 The leaf veination is very similar to that of the Little Queen, while the coloration and feel of the leaves is somewhere between the Little Queen and the Rugose Jewel. Most notably, the undersides of the leaves show a reddish coloration (see photo above, right) that is typical of those on the Little Queen, but absent in the Rugose Jewel. If I am correct, a selfing of this plant should yield some that look like the Little Queen and others that look like the Rugose Jewel. When compared to the Little Queen and the Rugose Jewel, A. maharani exhibits more growth vigor than either of those two Jewels. Again, this is what I would expect to observe while growing on a hybrid of the two plants. By the way, the added vigor shown by hybrid plants, when compared to that of their parents, is known as heterosis.